As Jonathan and Julia were getting ready to open the marine exhibit today, they asked me to look at a Dungeness Crab who was laying eggs. I was curious about the crab--it seems like the wrong time of year to lay eggs. I took a small sample and put them under a microscope to see if they were developing and didn't see much. It got me to thinking though. I wondered how Ruby, our little Octopus rubescens, was doing and if her eggs were viable or not. I took a quick peak at them yesterday and noticed that they were a nice peachy color. So I invaded her brood chamber and took 4 of her eggs. Right away I could see that they had eye spots and orangey-red dots on them. We put them under a microscope and could see the mantle pulsing and the chromatophores in the dots changing color. It was amazing! Here is a short video of the larva inside of the egg. Ruby laid her one to two thousand eggs on June 23rd and has been guarding them and blowing water on them to make sure they are well oxygenated since then. Although she came to our aquarium in March, she delayed the fertilization and laying of her eggs until she was secure and comfortable in her tank. Octopus rubescens are notoriusly hard to raise in captivity, but we will try to feed them artemia (brine shrimp) and see if we can be one of the first to raise them! I have to keep reminding myself that the reason many marine animals lay hundreds of eggs is that most of them will not make it to adulthood. Octopus are dedicated mothers and won't even eat while caring for their eggs. After she has witnessed her eggs hatching, Ruby will die. 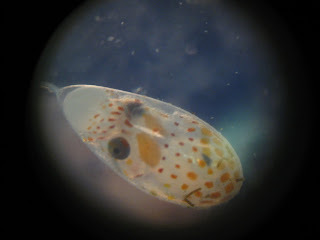 Here is one of the newly hatched larva. This octopus hatched as I was moving the sample eggs to a petri dish. You can see the round yolk sac near the short tentacles. We'll be sure to keep you posted on this unfolding drama. If you come by please ask us about these new babies, but remember that Ruby may still be in seclusion. This is really a fascinating story about Ruby and her eggs. Thanks for sharing it and keeping us up-to-date on the progress! Thats is so cool, marine life is so amazing and interesting. They're back and making themselves heard! Killer Whale sightings from PTMSC!